If you live somewhere in the country that gets a lot of rain, then you probably have had an instance of hydroplaning while you were in your vehicle. Hydroplaning can be very dangerous and should be avoided if at all possible. We here at Wyoming Valley Kia have some tips on how you can avoid hydroplaning. Make sure that your tires are in top shape. This will include monitoring the tread of your tires to make sure you have a good grip on the road. You should also have your tires rotated regularly. This will help keep your vehicle properly balanced. 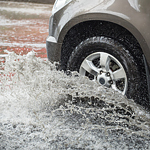 If you need a new set of tires, you can shop for tires that reduce the risk of hydroplaning. If you see standing water on the road ahead of you, you can slow your speed down as much as possible before you get to the area. Higher speeds will lead to more severe hydroplaning.